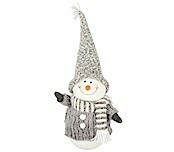 We think you will enjoy our wide selection of Christmas decorations. Here you'll find both large and small items to create a cosy Christmas atmosphere in your home. Check out our selection of gift bags for Advent, Christmas tree decorations, Christmas candle bridges and our life-like, non shedding artificial trees. Jolly Santa with parcel sack. Classic tree stand in plastic and metal construction. Elegant and glossy gift wrap. Create attrative Xmas presents and gifts.